Two companies with Sterling in their name were making synchronous clocks ca 1937. One was Sterling Croydon Clocks, Croydon, Surrey, who used the trade mark ‘Sterling’. The other was Sterling Clock Co Ltd, Dagenham, Essex, who used the trade mark ‘Ismay’. Comparison of a Sterlingclock with an Ismay clock shows a number of similarities of movements, cases and hands. The only significant difference is that the Sterling clock has Arabic numerals whereas the Ismay clock has Roman numerals. In addition, the starting mechanisms are identical. The two companies must have been closely associated, although the precise relationship is not clear. For more information on the clock click the link. I’ve recently started to collect clocks but they were all clockwork ones, wall, mantle and one carriage clock. 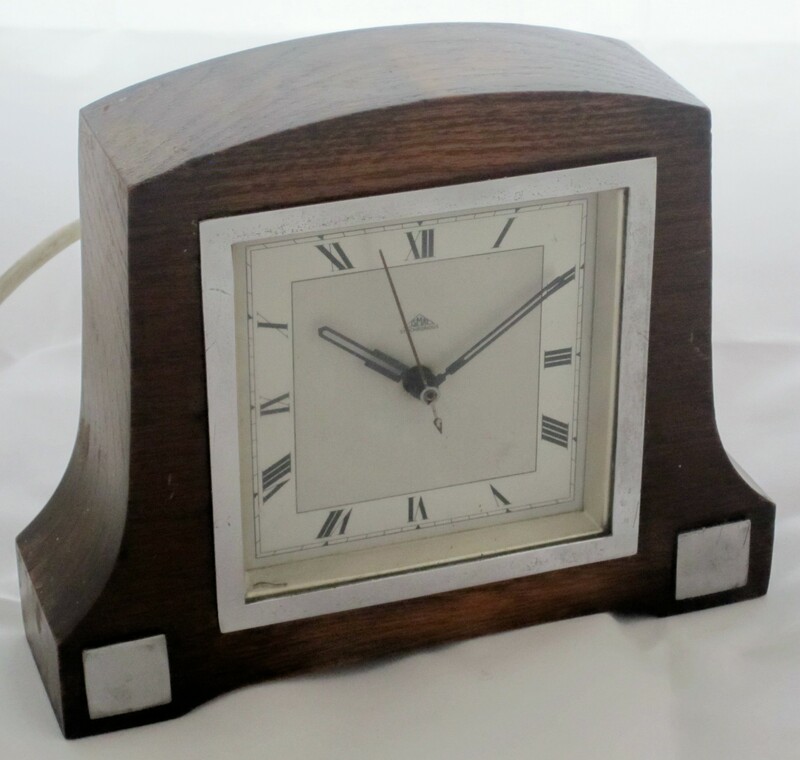 I then came across a nice Smiths oak mantle clock with an electric (sectric) movement, then bakelite clocks with similar movements. I then bought an unknown make of clock with a bakelite case that turns out to be a Sterling Cryden clock because it’s got Arabic numerals on the face and I’ve just collected an oak and chrome cased Ismay Sterling clock with Roman numerals on the face and I’m surprised that they are both made by different companies although as you state they must be connected because they use the same movement. I’ve had the bakelite Sterling clock for about 3 months and it keeps perfect time, but I’ve just serviced the Ismay Sterling clock and got it running because I only bought it yesterday but it’s been running since 11am this morning and it’s now 5pm and it’s still going so hopefully it’ll be o/k now and will be kept as part of my clock collection. If anyone has any more information on these clocks I’d be grateful to know more about them because I’ve searched the web but can’t find anymore information on the history of them.